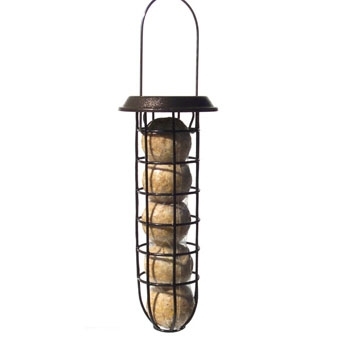 Attractive and durable, powder coated Suet Ball feeder holds 5 Wild Life Sciences Suet Balls. Attractive and convenient variety pack. 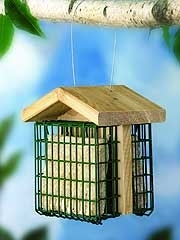 Contains 4 assorted Suet Plug Packs and Pine Feeder. Great gift pack and starter kit. 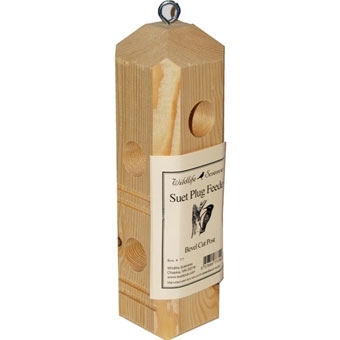 Attractively designed pine Suet Plug feeder. 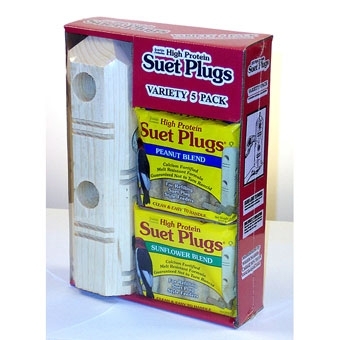 Holds 4 Wildlife Sciences Suet Plugs. 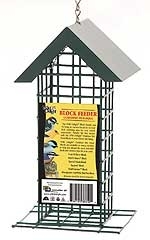 Wild Delight Block feeder is made of vinyl coated wire to protect the birds&#39; feet, tongue and eyes. Resists rust and stains. Created to work with the Wild Delight Outdoor Pet Food Blocks. A hanging natural reed feeder basket with our most popular suet blend already included; your furry friends will be able to recycle the basket and use for their nests! Allows birds to cling to the ornithologically correct feeder grids and peck at premium blend suet cakes. The natural feeding method that this feeder provides attracts birds that your other feeders do not. Proven to be a useful tool for successful bird feeding. 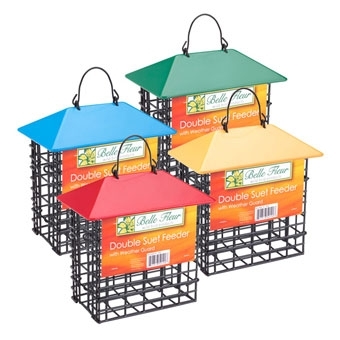 The two-sided design of the Double Suet Feeder allows multiple Clinging birds to feed at once. 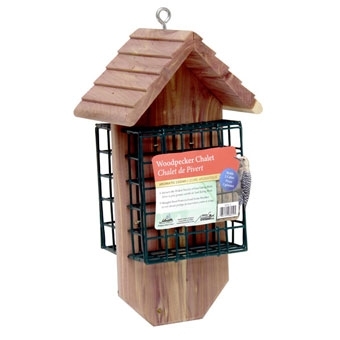 The Double Suet Feeder allows birds like Nuthatches and Woodpeckers to cling to the ornithologically correct grids and peck at premium blend suet cakes. The natural feeding method that this feeder provides attracts birds that your other feeders do not. The metalwork, and construction of this feeder are top-of-the-line. 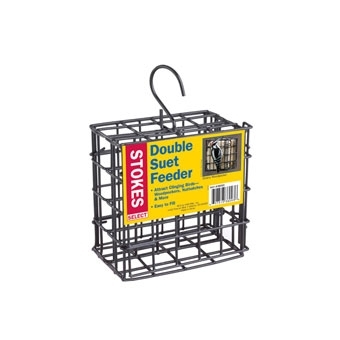 The Double Suet Feeder is proven to be a useful tool for successful bird feeding. Attracts clinging birds. 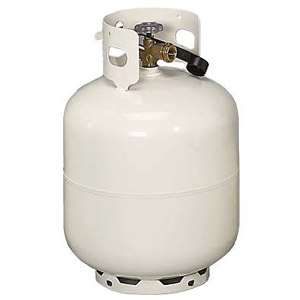 Easy to fill. The two-sided design of the Deluxe Suet Feeder allows multiple clinging birds to feed at once. This feeder holds up to 4 suet cakes and is designed to allow large clinging birds to easily feed and cling to the feeder. 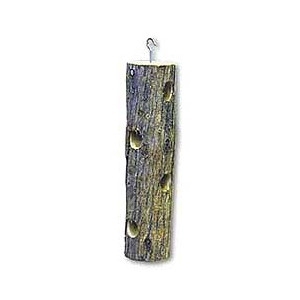 The Log Jammer is a natural log hanging suet feeder that is perfect for offering suet to your birds all year. Four 1.5 inch diameter holes have been bored through the center of the log for the placement of suet. The Heath woodpecker chalet holds 2 suet or seed cakes. Made from weather resistant cedar, it comes with a protective roof and a tail prop to accommodate woodpeckers. Proudly made in the USA by Amish craftsmen. 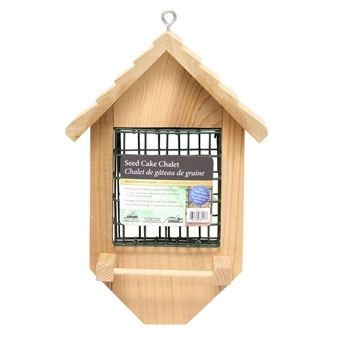 The Heath suet and seed cake large chalet holds 1 large suet or seed cake. It comes with a perch and protective roof and is made from weather resistant cedar. Proudly made in the USA by Amish craftsmen. 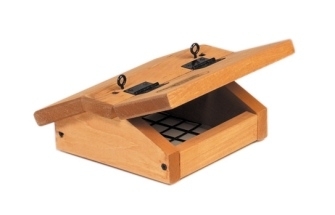 Designed to hold 2lb Seed Cakes or 4lb Suet Cakes. 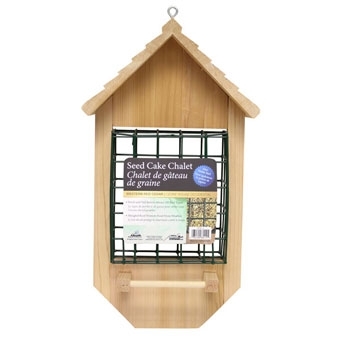 The Seed Cake Chalet is an Aromatic Cedar feeder that holds a Standard size Suet or Seed Cake. It features an extended tail rest for Woodpeckers, a perch for ease in feeding, a long lasting vinyl coated wire cage, and a sloped roof which extends the life of the cake. This feeder attracts the widest variety of cake eating birds. Proudly made in the USA by Amish craftsmen. 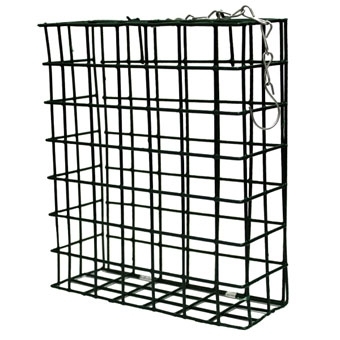 Birds are invited to rest on the cage or cling to the 1 x 1 black vinyl-coated cage, which is ideal for treating your backyard birds to their favorite suet or seed cakes. Simply lift the lid to place suet or seed cakes. This feeder's durable construction will make it a practical addition to your birding sanctuary for years to come. 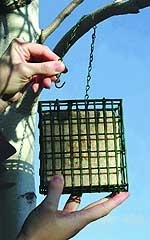 This feeder may be hung using the included chain hanger. 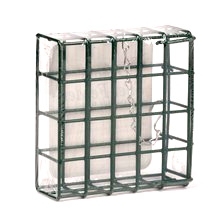 Dimensions for the individual cage is 8.25x3x7 inches. Made in the USA. Special basket with roof (to keep the rain out) and hanger included. 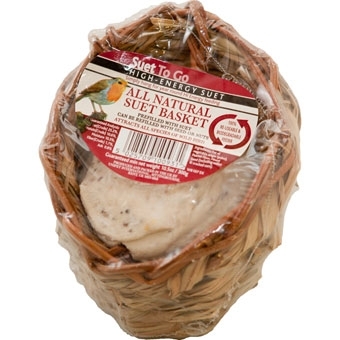 Our Suet Baskets are a necessary key to your successful wild bird feeding. Hinged roof opens for easy filling. Size is 8 in. height x 3 in. width x 8 in. depth. Holds one 12 oz. suet cake. 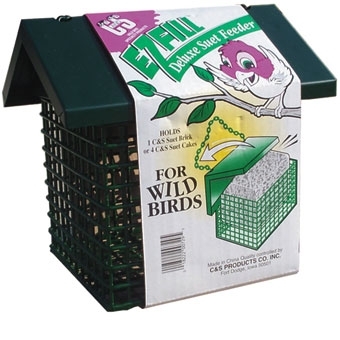 EZ Fill Deluxe Suet Feeder with Roof hold 4 Suet Cakes or 1 C and S Suet Brick. Green Color. Chain Hanger. 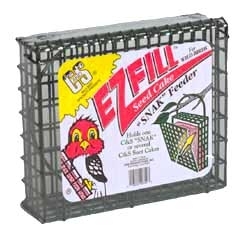 EZ Fill makes the chore of Filling Easy! 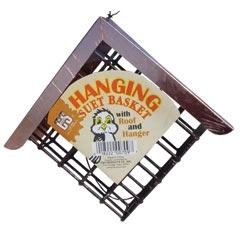 This classic hanging suet basket holds one suet cake. Quality construction for years of trouble-free enjoyment. Squirrel resistant. Vinyl coated wire protects birds feet. Prevents rust, stains and suet contamination. For best results, fill with Heath Premium Suet Cakes! 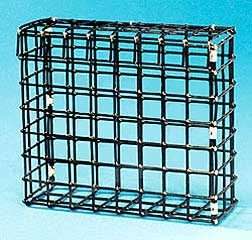 Plastic coated black wire cage with chain hanger. 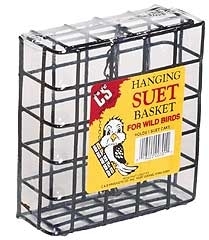 Our Suet Cages are a necessary key to your successful wild bird feeding. For seed / suet cakes. Vinyl coated wire with latch and hanging chain. Patented fold-down perch expands the variety of birds you can attract, because many birds require a perch to feed. 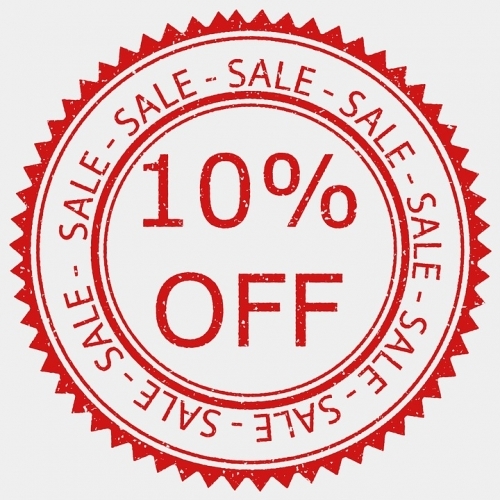 Use with our variety of Junior seed cakes, or with any of the small suet cakes in the marketplace. 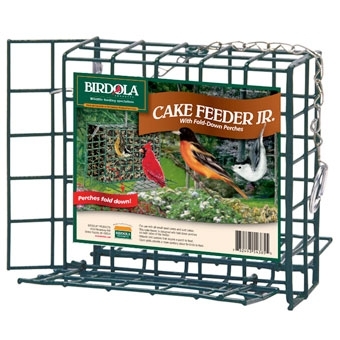 Birdola Cake Feeder With Fold-Down Perches .66 LB. 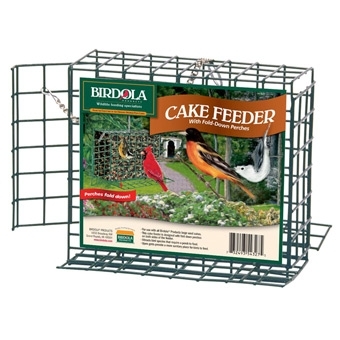 Birdola's basic wire feeder with fold-down perches made to fit any of our large bird and squirrel cakes. A perfect place to perch. Rooftop helps to keep suet dry from rain and snow. Attracts clinging birds. Easy to fill.